Forming a key component of the Sage 200 platform, Sage 200 CRM is a module within this software suite that best enables effective management of customer relationships. The features of Sage 200 CRM make it easy to use, but are also insightful and ensures maximum user benefit. As an acronym for customer relationship management, CRM is a business strategy that utilises customer information to gain a better understanding of their needs to in turn build stronger business relationships going forward. CRM Software, quite simply, is a software package that facilitates this CRM strategy, offering tools to manage and handle the functions of its process. CRM enables you to record important customer information, from interaction history to contact details, and use this information to deliver a more conducive customer experience, which ultimately results in increased customer retention through satisfaction and repeat purchases thereon. What is Sage 200 CRM? Sage 200 CRM has been designed on the basis of the award winning, web-based Sage CRM solution. This module can integrate within your processes to deliver comprehensive CRM functionality, whilst catering for the needs of departments sales, marketing and customer service within your business. As part of the Sage 200 Suite, Sage 200 CRM works collaboratively with the specific financial modules which means you can track every aspect of a customer interaction from lead source through to sale, invoicing and after care – and handling all the necessary paperwork and process milestones accordingly. Collect and retain customer information for that greater customer insight from the outset. Maximise sales performance and revenue through effective management of this pipeline. Manage the planning, execution, targeting and measurement of marketing campaigns and deliver on ROI. Maintain up-to-date customer records for efficient service delivery throughout. Develop an increased customer satisfaction and retention strategy. Removes the need to duplicate the input of data – with integration to Sage 200, contact information need only be keyed into one system, removing the opportunity for error associated with multiple inputs in separate systems. 360 degree view of the customer– with all your customer information in a single database, all your employees across the entire organisation can access and share up-to-the-minute information. Front line staff can easily view transactional data and back office teams can easily see customer interactions from the service and sales departments, breaking down exclusive departmental data stores. With a complete perspective of your customers, your employees can provide a more responsive customer service and better provision towards customer experience. Recognise Financial information within CRM – sales professionals can view financial information within Sage 200 CRM including credit limits, stock and outstanding invoices, thus enabling better informed business decisions. This essential activity is determined by the streamlined Sage platform and integration with all other associated modules. Access data anytime, anyplace – a very real and key feature in Sage 200 CRM is its accessibility via a web browser. This ultimately means that as long as you have an internet connection, you can access Sage 200 CRM data at anytime and from any location, including whilst ‘on the road’ or remotely from home. Automate business administration processes – by automating labour-intensive manual administration processes your workforce’s productivity will increase drastically. Working cross-modularly, you can deliver on tasks within Sage 200 CRM, using tools from Sage 200 Financials and Commercials, for example. Sage e-Marketing integration – CRM works for business functions sales, marketing and customer services particularly. You can achieve seamless CRM integration with specific marketing campaigns to inform all these associated business departments, where all feed into the process of actioning these campaigns and depending on the outcomes. Whilst integrated with Sage e- Marketing especially, users can create high quality, targeted email marketing campaigns from within Sage 200 CRM, whereby all results are recorded into this module to enable accurate calculation of ROI and measure the success of these post-campaign. 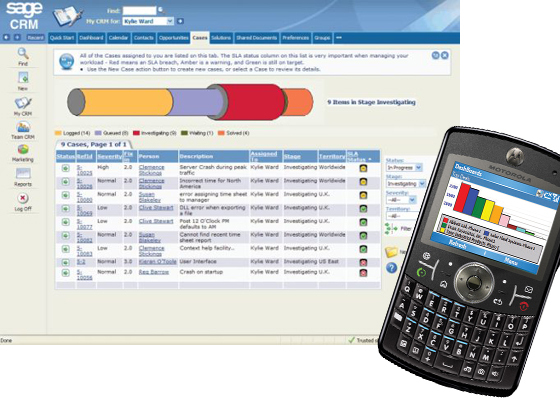 Interactive Dashboards – offering enhanced user productivity, Sage 200 CRM facilitates role-based interactive dashboards allowing individual users to efficiently manage all their activities from a single location. For more information about Sage 200 CRM, contact ibex.